Jones MVIP is a Euro rack module designed by Dave Jones. It is a stand-alone video image processor. The packaging, power, and control voltage inputs are compatible with Euro rack modules such as Doepfer, Make Noise!, etc. The MVIP digitizes video input into 24 bit component format – 8 bits for Luminance, 8 bits for PB or B-Y, and 8 bits for PR or R-Y. Component video consists of three signals. The first is the luminance signal, which indicates brightness or black & white information that is contained in the original RGB signal. It is referred to as the “Y” component. Y carries luma (brightness or luminance) and synchronization (sync) information. Y = 0.2126 R + 0.7152 G + 0.0722 B. Before the advent of color television, the Y axis on an oscilloscope display of a video waveform represented the intensity of the scan line. With color, Y still represents intensity but it is a composite of the component colors. The second and third signals are called “color difference” signals which indicate how much blue and red there is relative to luminance. The blue component is “B-Y” and the red component is “R-Y”. The color difference signals are mathematical derivatives of the RGB signal. PB carries the difference between blue and luminance (B − Y). PR carries the difference between red and luminance (R − Y). Green doesn’t need to be transmitted as a separate signal since it can be inferred from the “Y, B-Y, R-Y” combination. The display device knows how bright the image is from the Y component, and since it knows how much is blue and red, it figures the rest must be green so it fills it in. Video in, control voltage inputs, and video out are on the left side of the module. Video in and video out are RCA plugs, and control voltage inputs are standard mini plugs. Control voltage attenuators are in the middle of the module, manual controls on the right side. Brightness lightens or darkens the image. The middle position is normal, turn to the left to dark the image and to the right to light the image. When bitswap is active the control pushes the image up and down through the bitswap thresholds. Hue 1 balances the B-Y component of the color signal. The middle position is normal, turn to the left to push the image towards yellow/green and to the right to push the image towards blue. Hue 2 balances the R-Y component of the color signal. The middle position is normal, turn to the left to push the image towards cyan/green and to the right to push the image towards red. Bitswap rearranges the the colors and shades of gray in the image. Strong edges divide the changes and outline shapes in the image. Noise in the image is amplified, this can be a plus or a minus. No bits are swapped when the control is turned fully counterclockwise, the off position. As the knob is turned clockwise, to the right, it passes through 32 steps. Every 8 steps bits are swapped in different ways, the severity of the effect increases as the control is turned up. The effects begin with subtle color changes and by the end, the control turned fully on, the bits are rearranged to the point that the image bears little relation to the original. In Bitswap the Brightness control moves the hard edges in the ‘bitswaped’ image. Mode is the most complex control. It is divided into 4 sections. The first quarter turn is the Positive Image Mode. It’s divided into 4 steps – full color, 4 bit color, 3 bit color, and 2 bit color. The Full color mode has 32 bits of Luminance, 32 bits of B-Y, and 32 bits of R-Y. The 2 bit mode has 2 bits of Luminance, 2 bits of B-Y, and 2 bits of R-Y. That’s 64 possible color variations. The second quarter turn is the Negative Image Mode. It’s the same as above, but uses negative video. The third quarter turn is the Pixelization Mode. It’s divided into 16 steps, going from fine to coarse. The works horizontally, across each scan line. It turns the image into columns of wide pixels. The fourth quarter turn is the Luminance Coloring Mode. It’s divided into 32 steps. The first 16 steps us positive luminance, the second 16 negative luminance. In this mode the colors of the original image are replaced with new colors based on the luminance levels of the original image. The colors change as the image get brighter or darker. In the Luminance Colorizing Mode, Hue 1 and Hue 2 still change the color of the image but they use artificial colors rather than shifting the original colors as in other modes. Attenuating the CV input limits the changes made to the image. Mapped to stay within one group of effects, the CV input and manual control produce interesting changes such as going from fine to course to fine pixelization. Crossing the boundary between modes creates horizontal bars, each one a different mode. 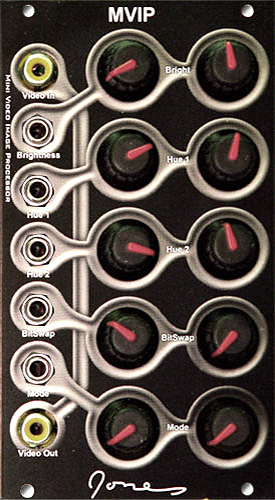 Control voltages inputs and attenuators correspond to Brightness, Hue 1, Hue 2, Bitswap, and Mode. CV inputs are sampled at 6 x the horizontal scan frequency, or 6 time every scan line. The CV input values are summed with the value of the manual controls. With the CV attenuator turned fully counterclockwise, or ‘off,’ the CV input has no effect. As the CV attenuator is turned clockwise, or ‘up,’ the effect increases. If no image is input, the MVIP can still produce video using the Control Voltage inputs.